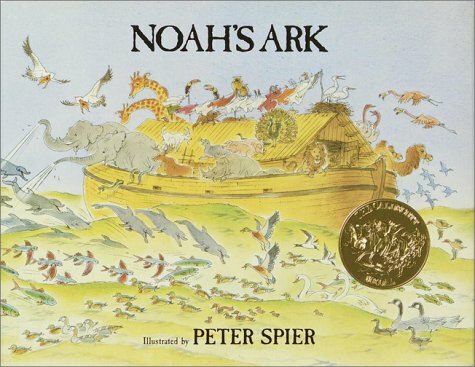 I’ve read Noah’s Ark, by Peter Spier, a great many times. I can’t tell exactly how many because, as you might guess, most of the readings occurred in early childhood. Even the word “read” may be a misnomer, since it’s a picture book and the text consists of one poem plus one sentence. But I’m including it here because it’s too good not to mention. Noah’s Ark is about the details. Spier gave enormous care and attention to every single picture. The result is the most wonderful series of illustrations that I’ve ever seen in a picture book. 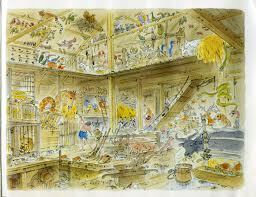 Spier clearly loved animals, as shown both by the enormous variety he includes and the detail he gives to each one. But rarely do the panels focus on a single animal, instead they provide a remarkably accurate portrait of what happens when members of many species are confined in a small space. The book has humor: Noah’s pulling a stubborn donkey into the ark, an owl standing on another owl’s head, a stampede of rabbits vacating the ark at the end. It also has pathos. Several pictures show the ark from the outside, floating alone on an endless sea. An unforgettable picture shows the animals that didn’t get on the ark as the floodwaters rise around them, eventually leaving only elephants and giraffes raising their heads above the waves. It is, in short, a wonderful book, full of everything that a children’s book should have.